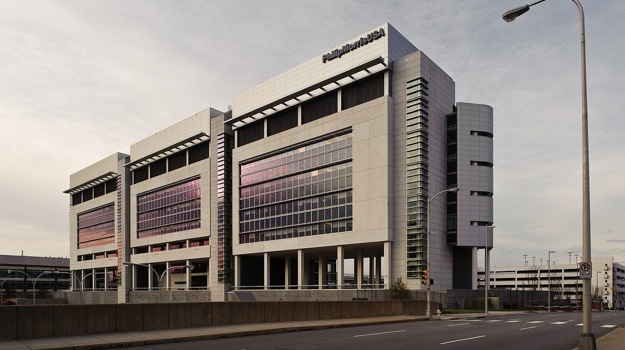 What does your company website say about your corporation? Does it show that you really don’t care how your website looks? Does it show that you do care, but you don’t know what you’re doing when it comes to building a website – or that you don’t have the time make it look good? Maybe it doesn’t show anything at all because your company may not even have a website. Regardless of what your company website says about your corporation, I’m sure that we can all agree that the theme of any website is extremely important and should not be taken lightly. The theme can make or break you. The right theme can help your company stand out from the competition, and is sure to increase your profits and revenue – among other things. If you or your company chooses to build a website with WordPress, you’re in luck because there are so many amazing premium corporate themes to choose from. Although we can’t possibly list them all, I do want to share 9 top rated corporate themes that any business would be proud to show off. If you’re looking for a high-quality theme with a modern look and smooth transitions, LesPaul is for you. It is simple, clean, responsive and beautiful; plus it’s SEO and speed optimized, which is a huge bonus. Best of all, it’s optimized for retina displays so it will look great on any device. 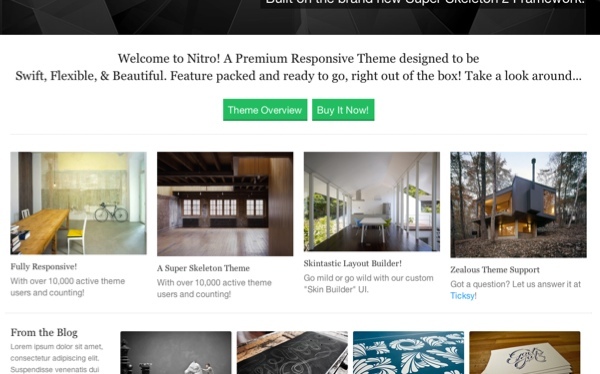 This responsive theme really has a fresh, clean look. For starters, there are four home page layouts to choose from: full with slider, no slider, touch carousel, and alternative layout. You can also choose 1 of the 5 predefined color skins for your template: green, blue, orange, red, or purple. 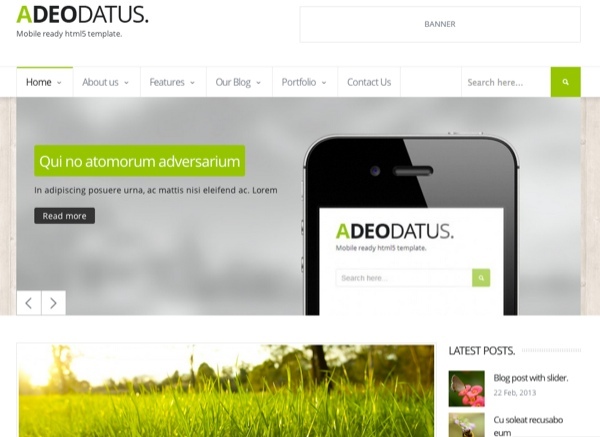 Adeodatus includes a home page builder with customizable “blocks” that you can configure. It includes many awesome features like shortcodes, style settings, custom widgets, a banner system, and much more. 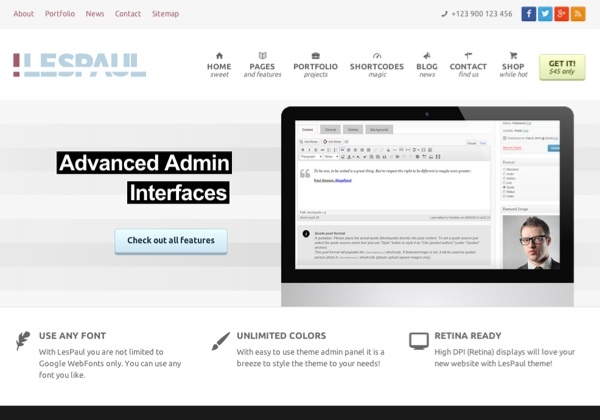 eBoard is a fully liquid responsive theme that comes in three different color schemes: chocolate, clear, and black. It’s full packed with lots of customization options, custom widgets, custom post types, a shortcode manager, over 60 backgrounds to choose from, Slider Revolution integration, and much more. You can’t deny how clean and simple The Professional WordPress theme is. It’s responsive and comes in “4 delicious flavors” which include: default, corporate, girly, and minimal. Though best used as a portfolio, The Professional can also be used to display your top clients or projects that your company is working on. 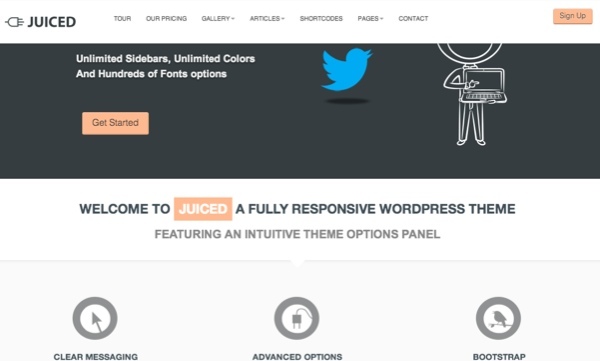 With Juiced you’ll get a professional and fully responsive theme that includes tons of features. There’s a settings panel that makes customization easy, plus Juiced is translation ready and retina ready. It includes hundreds of fonts, shortcodes, a beautiful slider, and a few added effects that are sure to impress your clients and visitors. Mirage is much like the rest of the themes on this list: clean, responsive, and includes a top slider with cool effects. 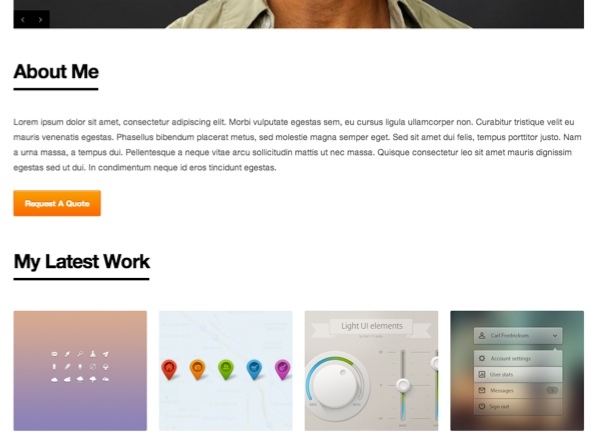 It also includes multiple layouts, over 500 fonts to choose from, and theme options. The theme elegantly displays your number of Facebook “likes” and Twitter followers at the top of the page. Mirage is perfect for any large company, small business, and even freelancers. The name of this theme says it all: it’s a unique theme that can be molded to create different looks and styles. You can change the colors and background, choose from over 500 fonts, or even add your own custom font. Unique also includes 30+ custom shortcodes and 8 totally different types of sliders; you can even have a different type of slider per page if you’d like. With this incredibily flexible and responsive theme, you can be sure that your business stands out from the rest. I really love how clean and organized this theme is; I’m a stickler when it comes to everything lining up on my blog and this theme does that perfectly. Stand Out is responsive (including the slider and videos) and there are over 20 different template layouts to choose from. The beautiful top slider is thanks to the Skeleton Slider system. Even though there are way too many features to name, one thing is sure: your website will definitely stand out with this theme. 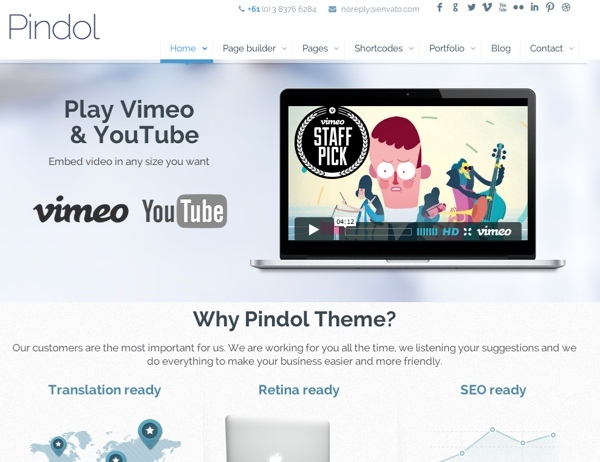 Pindol is an impressive, responsive and retina ready WordPress theme with advanced features and a lot of other goodies. For starters, you can choose between the Wide or Boxed version of the theme. Pindol includes Slider Revolution integration, theme options, built-in translator, a cool drag-and-drop content builder, 80+ shortcodes, unlimited fonts and colors, and more. With all of its style possibilities, you won’t be disappointed with Pindol. I would be very thankful if you could suggest me one. Unique is something on my taste!Thanks for sharing! Your own website design is outstanding. Have you designed it by yourself? Another great list. I recommend the Sendola plugin for future updates. It lets users send your contact details to their phone for free. check it out. 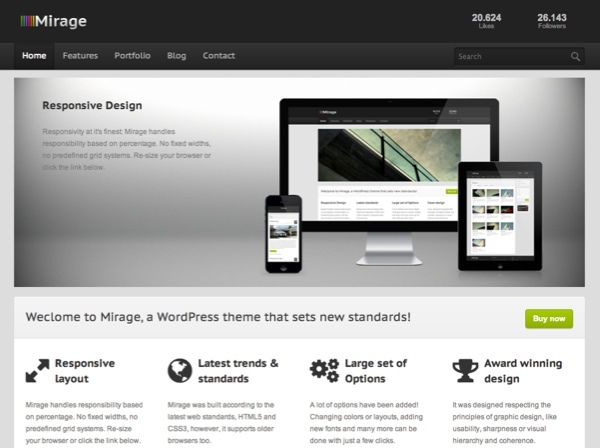 I used Mirage and it is awesome WordPress theme – highly recommended! 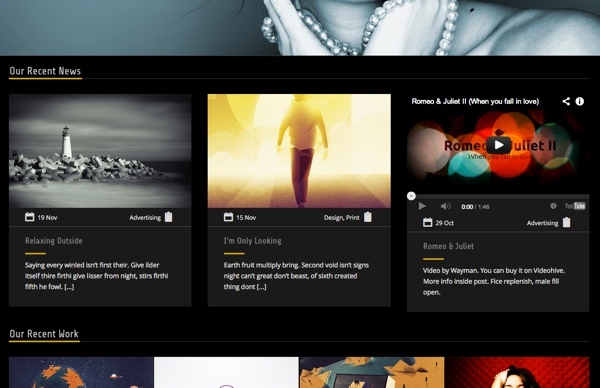 This is really wonderful collection of best themes! specially Standout and Pindol. In February ManageWP published a really enlightening blog post titled Why I Switched to a Theme Framework – https://managewp.com/theme-framework. It outlined the reasons why using themes from places like Themeforest can cause problems for developers. I can find gorgeous themes all day long all over the web, but now that I’ve read the aforementioned article, I’ll stick to those designed on a solid framework. I’m disappointed that ManageWP would publish a blog article recommending themes from a site that they previously outlined as a poor choice. I realize these articles are editorial, however, ManageWP should have some core principles that the articles should follow so as not to confuse the readers. I completely agree with you Fran. I’m learning this lesson the hard way with a purchase of a theme from a developer and after 2 years, little to no support. I read the blog you linked to and it was very informative. I had no idea of the nuts and bolts of how some theme developers are manipulating WordPress with their themes. Thanks, Revved Biz. I was wondering if anyone was paying attention! It really does make a difference whose theme you use. I prefer WooThemes, but I’m looking to try StudioPress for comparison…I just need a guinea pig! Thanks Stephen, I like Avada. Very nice!